I had such an unforgettable trip to California, with more unique experiences than I could possibly fit into one article. 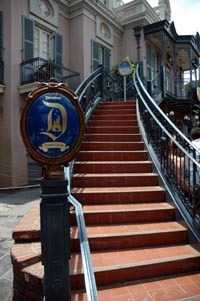 Look for weekly updates on my trip, which will include my photos (and thoughts on) the NFFC convention, as well as Club 33, Disney’s Burbank Studios, El Capitan, the Disneyland Dream Suite, Comic Con, and so much more! Thank you to everyone who stopped by during the room-hopping and NFFC Show and Sale! I enjoyed meeting everyone and appreciate your support. 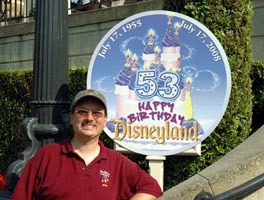 One of the highlights of my California trip each year is to celebrate the birthday of Disneyland. It really is a special day for me, and I was lucky to get to spend it this year with friends and at a special NFFC event! 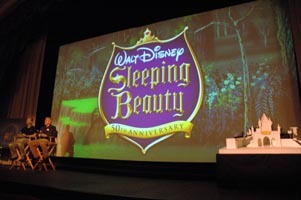 Normally the NFFC leaves the day completely open – but NFFC members were treated to a special announcement in the Lincoln Theater by Tony Baxter. It wasn’t a surprise that the Sleeping Beauty walk-through was going to be reopened, it’s been apparent for quite some time. However, we not only were there for the official announcement of the “reawakened” version of the walk-through, but shown original artwork and models as well. Presenters were: Andy Siditsky, Sr. 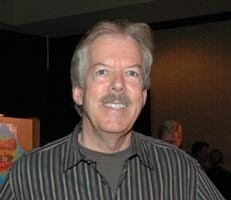 Vice-president of Walt Disney Home Entertainment, Tony Baxter, Sr. 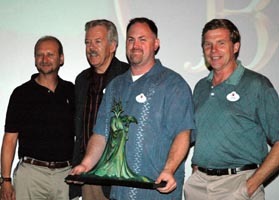 Vice-president of Walt Disney Imagineering, Chris Merritt, Art Director for WDI, and John Gritz, Technical Director for WDI. 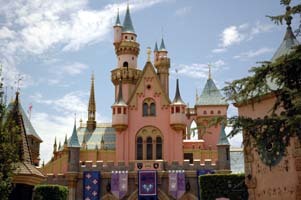 “It is fitting that we are announcing the return of a classic on the 53rd anniversary of Disneyland,” said Tony Baxter. 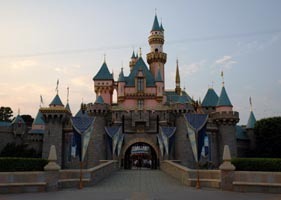 With the 50th anniversary of Walt Disney’s “Sleeping Beauty” approaching, Baxter said that the excitement around the movie created interest in the return of the Disneyland attraction. 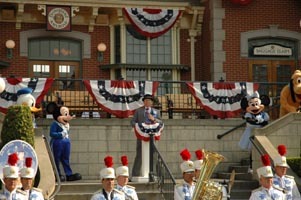 As in previous years, the re-dedication ceremony was conducted by the Mayor of Main Street, flanked by Mickey Mouse and his friends. While covering the NFFC convention, I was one of 30 lucky winners to win a tour of the Disneyland Dream Suite for myself and one guest from designer Kim Irvine. 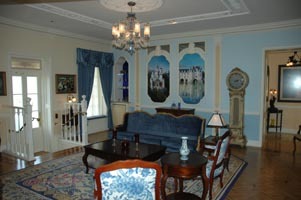 The Disneyland Dream Suite includes a living room, open-air patio, two bedrooms and two bathrooms. Please check back soon for a full report with photos from this very special location! It’s hard to believe a year has passed since the last California NFFC Convention, but I’m packing my bags to attend next week! In addition to this special Disneyana event, I have a packed schedule which will include my first-ever Comic-Con convention. The NFFC convention schedule has just been released and you can read it HERE. 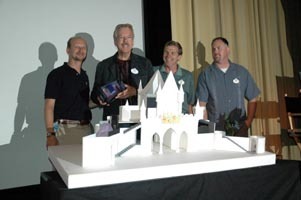 Legendary Imagineer Tony Baxter is a new addition to the schedule, as well as a very special appearance by Disney Legend Wally Boag. Wally will be joined by his son Laurence (who has inherited his fathers wonderful sense of comedic timing) as well as his friend Gene Sands. 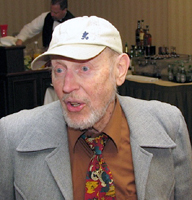 Gene is working with Wally on the book “ Wally Boag: The Crown Prince of Disneyland“. I will be attending the entire convention and will have a table at the giant NFFC Disneyana Show and Sale. The sale date is Sunday, July 20th at the Crowne Plaza Hotel and Resort (12021 Harbor Blvd. Garden Grove, CA). If you are attending, please stop by and say hello (click HERE for a flyer with a $1.00 off coupon). I look forward to meeting everyone! I will also be opening my room at the convention hotel for room hopping on Saturday, July 19th. For more information about the NFFC please click HERE. 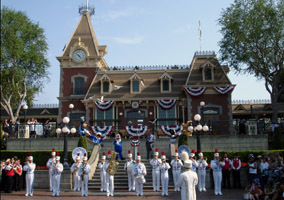 One of the highlights of my yearly trip is to celebrate Disneylands Birthday! 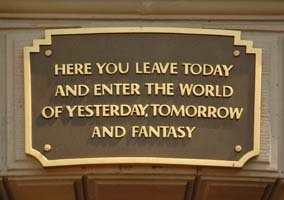 As a diehard Disneyland enthusiast (and Disney in general! 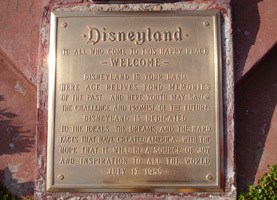 ), I’m known to never leave the park before closing – and July 17th is no exception. 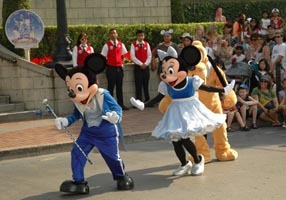 My Disneyland birthday tradition is to join my friends for a full day in the park, riding all of the opening day attractions from 1955. This year will be my first at the frenetic Comic-Con International convention! 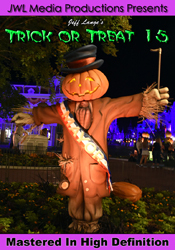 For years, friends have been trying to drag me away from Disneyland to attend this huge event. I’ll be covering the convention as part of JimHillMedia. Please check back here in late July for a full report on my experience! Thank you to everyone who voted in the poll that my partner site Mousesteps ran! 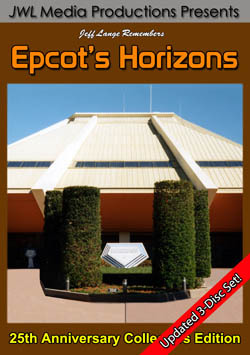 I was thrilled with the response, and you overwhelmingly favored a vintage WDW resort DVD series. I’ve been busy digitizing old footage, and getting it organized for editing. 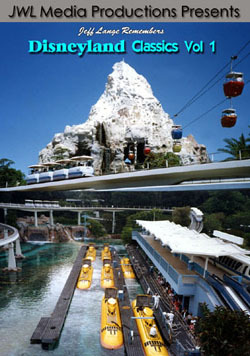 Look for a late summer/early fall release of my first vintage resort DVD! 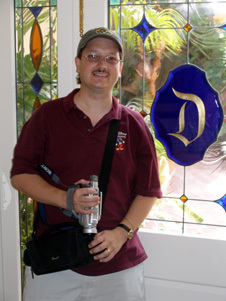 While in California, I will be recording video for upcoming DVD projects including a “Disneyland Resort, After Dark” title and the next in the “Disneyland, Class of” series! You can find other titles in that series in the JeffLangeDVD store. 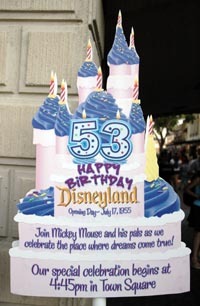 Just in time for Disneyland’s 53rd Anniversary we have these title available now! 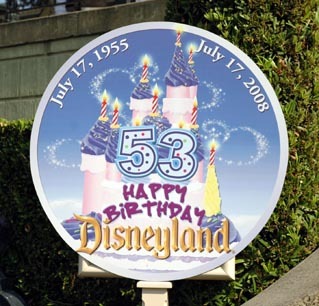 Jeff Lange Remembers: Disneyland’s 35th Anniversary, Jeff Lange Remembers: Disneyland’s 40th Anniversary, Jeff Lange Remembers: Disneyland’s 40th Birthday and Jeff Lange Remembers: Disneyland’s 45th Anniversary! 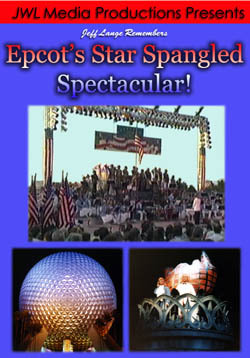 Jeff Lange Remembers: Epcot’s Star Spangled Spectacular DVD – Re-Released Today. To purchase this JeffLangeDVD title, click this LINK. Windsor, Conn. (July 2nd, 2008) – To celebrate Independence Day ( for one week only!) 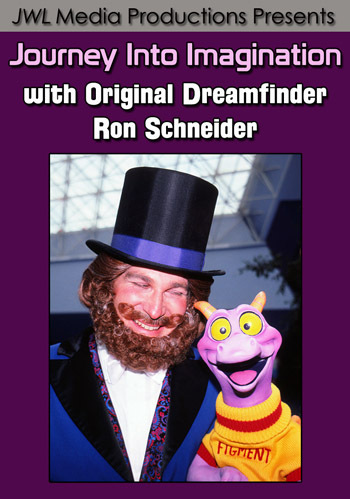 JeffLangeDVD is Re-Releasing Jeff Lange Remembers: Epcot’s Star Spangled Holiday Spectacular! DVD.